We challenge all Cosmo chicks to join the fight against this dreaded disease plaguing women everywhere. Learn more about it, so you can do more. 1. According to The American Cancer Society, breast cancer is the most common cause of cancer in women, excluding skin cancer. Worldwide, approximately 1.3 million cases of breast cancer will be detected each year. The chance of a woman having invasive breast cancer some time during her life is a little less than one in eight. 2. According to the World Health Organization, breast cancer was cited as one of the top five causes of cancer-related deaths worldwide in 2008. The organization estimated that out of approximately 7.6 million deaths, 460,000 were caused by breast cancer. 3. Breast cancer is the most common cancer both in developed and developing global regions, with around 690,000 new cases estimated in each region. 4. Women age 40 and older should have a screening mammogram every year, and should keep on doing so for as long as they are in good health. While mammograms can miss some cancers, they are still a very effective way to find breast cancer. 5. Women should begin breast self-exams in their 20s. 6. Approximately 5% to 10% of breast cancer cases can be attributed to genetic predisposition--20% to 30% of women with breast cancer have a family member with the disease. 7. The worldwide breast cancer epidemic has many causative factors, including reproductive history, genetics, radiation, and diet. 8. At least 150 minutes of moderate intensity aerobic physical activity throughout the week for people aged 18 and older can reduce the risk of noncommunicable disease, including breast cancer. 9. One percent of all people diagnosed with breast cancer are men, and countless men are impacted through the diagnosis of a loved one. 10. Breast cancer is about 100 times more common in women than in men. For men, the lifetime risk of getting breast cancer is about 1 in 1,000. Every responsible Cosmo girl knows caring for her health should be a priority. So, this Breast Cancer Awareness Month, we encourage you to educate yourself about the disease. Support The Estee Lauder Companies' Breast Cancer Awareness (BCA) Campaign, which will be launched in the Philippines on October 13, 2011. Now on its 19th year, the campaign aims to eradicate breast cancer by raising funds (over $8.5 million have been donated to research), promoting early detection, and spreading life-saving information. Estee Lauder spokesmodel Elizabeth Hurley says of the BCA Campaign, "This is a disease that knows no boundaries and does not discriminate, touching everyone in every country.... Now more than ever, it is important to join together to get the message out: to tell everyone we know to see their doctors regularly and get a mammogram every year if over the age of 40 because if a localized breast cancer is detected early, it's 98% curable. Survival rates are rising and each year we get closer and closer to finding a cure for this disease." The theme of this year's campaign is "Together. Connect. Communicate. Conquer. For A Future Free of Breast Cancer." This spirit of solidarity is seen in the collaboration of more than 70 countries on the Global Landmark Illuminations Initiative, which has bathed over 200 famous landmarks in bright pink light in the name of Breast Cancer Awareness (launch the gallery to see some of these landmarks illuminated in pink!). The Philippines is stepping into the pink spotlight this month with our own landmark, Lor Calma's "Transformation" sculpture at Bonifacio Global City. Stay up to date on the project by checking out their newly-launched official website. You can support the BCA Campaign by wearing Estee Lauder's iconic Pink Ribbon, a global symbol for breast health. You can also make better use of your time online by checking out their Facebook app, which allows you to send Messages of Hope to people who are afflicted. 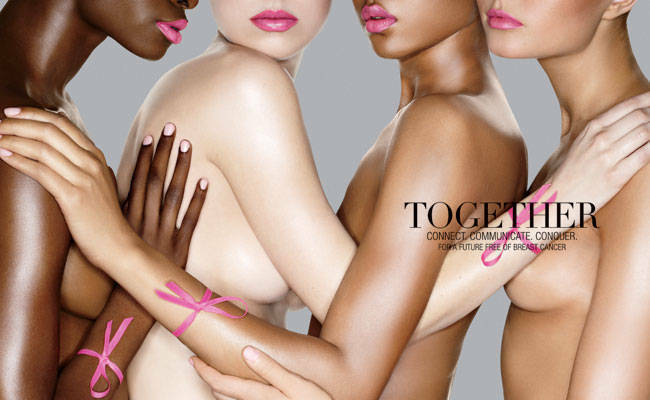 Another world-famous brand is also promoting Breast Cancer Awareness this month. Cosmo's sister mag, Women's Health Magazine, has partnered with Avon for their annual Kiss Goodbye to Breast Cancer (KGBC) Walk and Run events to raise funds for the Philippine General Hospital Breast Care Center and selected provincial hospitals. As part of their 125th anniversary celebration, they aim to build a giant pink ribbon made of Kiss Cards (included in the race kit) in a campaign dubbed "Race to 125,000 Kisses." Special guests at the marathon include Rhian Ramos and Avon's newest endorser, Miss Universe 2011 3rd Runner Up Shamcey Supsup. You can join the 3K Walk by purchasing the KGBC shirt (P220) which serves as your registration. You can also opt to join the 5K and 10K Runs that have registration fees of P500 and P650, respectively. The Walk and Run events will kick off on October 9, 2011 at the SM Mall of Asia IMAX Open Grounds. Those of you down South can join the Walk at SM Lipa on the same day, while gals from the North can join the Walk at Cabanatuan on October 16. For more info, visit their official website and Facebook page. Launch the gallery to see photos from the Estee Lauder BCA Campaign, plus the Avon-Women's Health BCA marathon. Sources: American Cancer Society Facts & Figures: 2009-2010 and the World Health Organization; information courtesy of Estee Lauder.